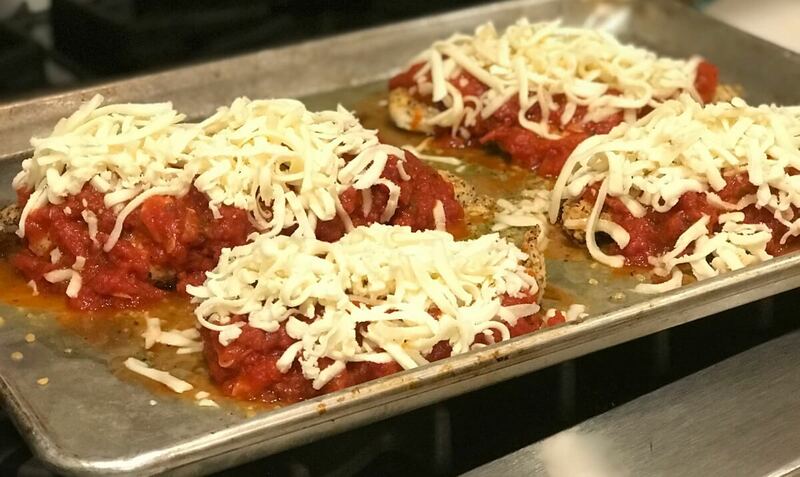 I have made this Gluten Free Chicken Parmesan without Bread Crumbs several times and shared it on my Instagram stories. It is, by far, the most requested recipe on there. So, instead of typing and retyping it to all those that asked for it. I thought, why not make a post for everyone to see it. Plus, now you can print it to keep in your family favorite binder. This recipe is great for a couple of reasons. One is that it’s super easy and delicious. 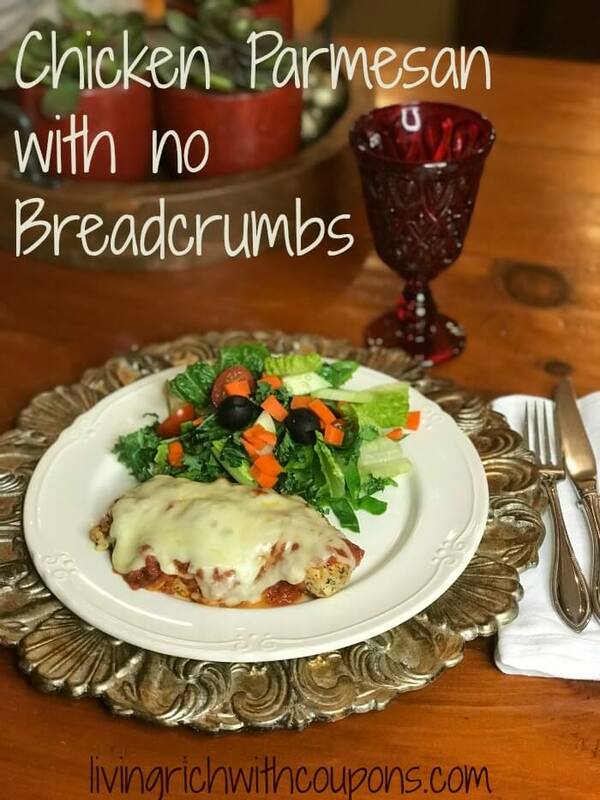 The second is that you use no breadcrumbs. 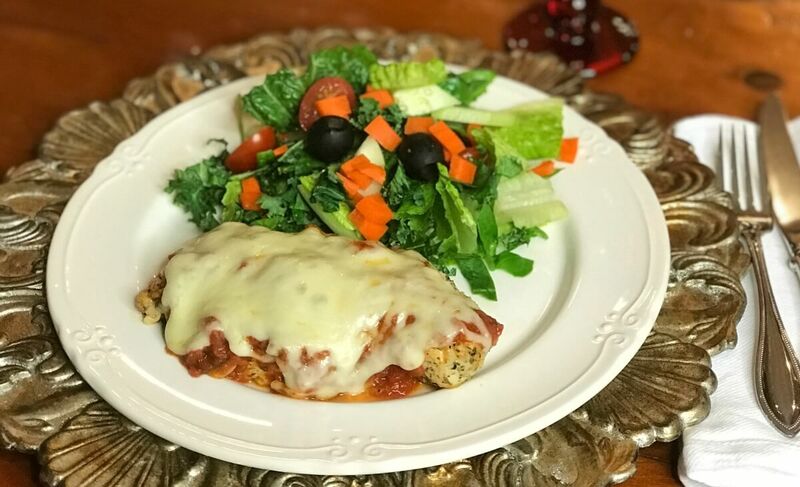 So, for those that are gluten free, on a keto diet or just looking a low carb chicken parmesan recipe, this one is for you. 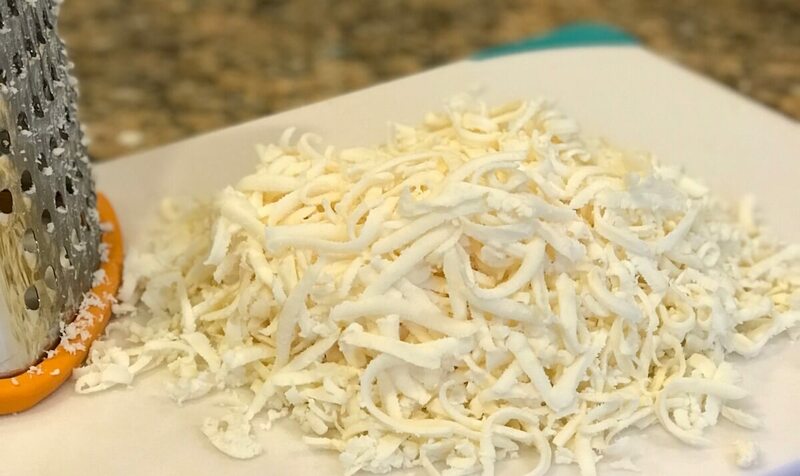 I use fresh grated mozzarella cheese. In my opinion, pre shredded mozzarella is too chalky. Personally I don’t like to slice the mozzarella and place it on top. I think it melts better and more evenly if it’s shredded. 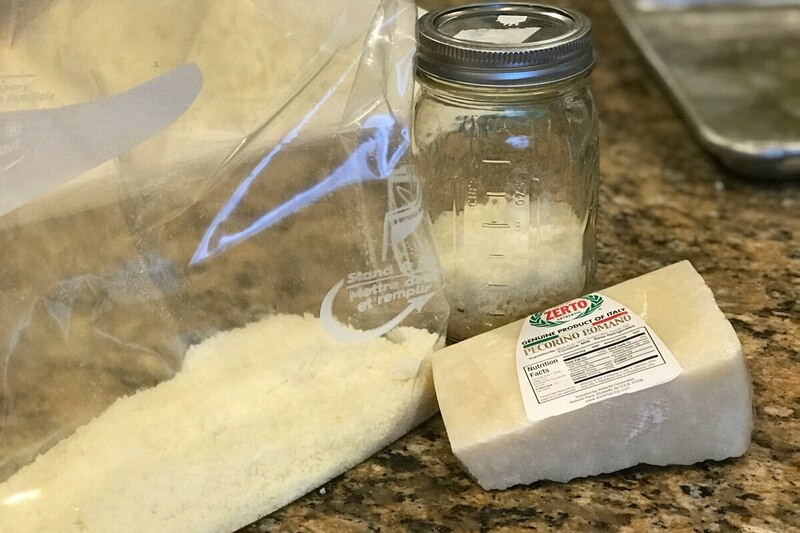 I like fresh Pecorino Romano cheese (not that “Krafty” stuff in a bottle). I found the chunks on sale recently for just $5.99/lb which is an awesome price. These usually average around $11.99/lb. I usually grate it down to a fine powder by cutting it into chunks and putting them in my mini food processor using the regular metal blades. I stop and start a few times to be sure the chunks get chopped well. You can make it fine or keep it a little chunky if you want. Just keep processing it down until it’s the texture you want. Place the grated cheese into a ziploc bag. To the bag you are going to add your seasoning and shake to combine. I make my own Italian seasoning but you can certainly use one premade. My recipe is simple. Add equal parts dried basil and dried oregano. Generous amounts of salt, pepper, garlic powder and onion powder. That’s it. I’ll do a post on it in the future but for now, there ya go! Place one piece of chicken in the bag at a time and shake it around to coat the chicken. Then place the chicken on a, slightly oiled, cookie sheet. I sprinkle some of the leftover cheese mixture on top. Bake the chicken for about 25 minutes at 400 degrees. Remove chicken from the oven, top with your favorite jar sauce or your own, homemade sauce. Then top it off with the shredded mozzarella cheese. Bake for another 7-8 minutes until the cheese is just slightly brown. 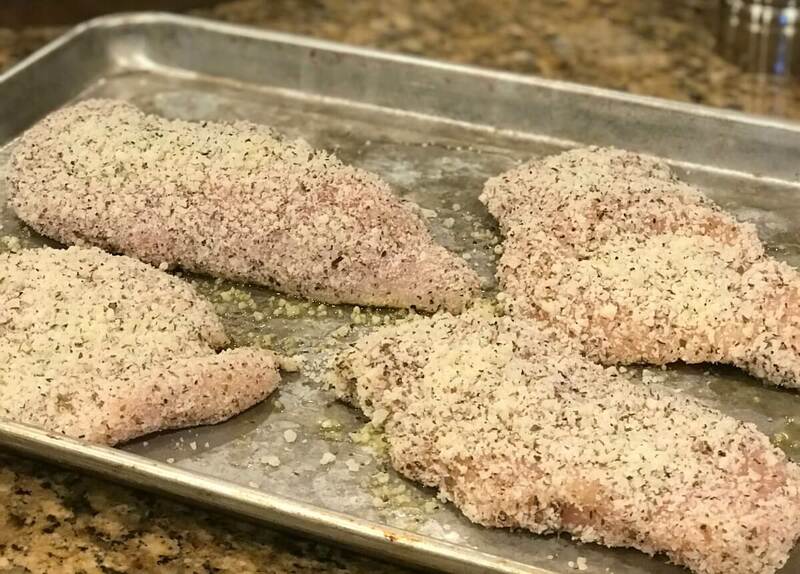 Place 1 chicken breast at a time in the bag and shake to coat. Bake another 7-8 minutes until slightly brown. Elmer’s Glue Just $0.67 at Dollar General!